My husband's great aunt was chatting with her niece- my husband's cousin- and mentioned that I was doing some family history research. Fancy that! She'd saved what her mother had worked on and whatever else had come her way. We'll call her "C". C emailed and we introduced ourselves. She offered to scan what she had and pop it into an email. Knowing how time consuming and fun scanning is I imagined more than a month before I would see anything. Another tidbit of interest she included was an invitation to a family reunion in 1988 (pictured). 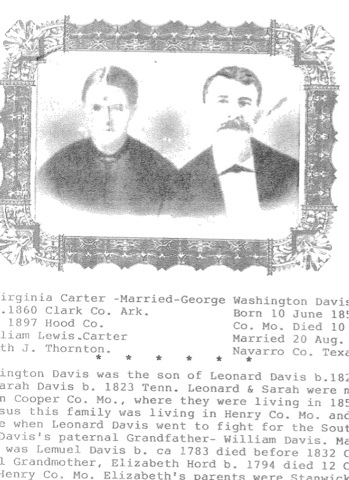 No guest list or author credit on that one but includes Fanny and George Washington Davis's picture. I would to know who holds the original but I'm quite pleased to have this copy. I mean- wow!